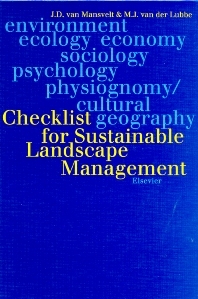 This work is an interdisciplinary, cross-cultural, widely-calibrated checklist for EU sustainable landscape management, which is intended to serve both as an analytical tool of reference as well as a design tool for local, regional and European policy making on sustainable developments. The tool has been developed out of a multidisciplinary study in EU countries which was designed to find out what would be the overall requirements for a sustainable management of the landscape of rural areas. Could these stipulations be brought together in a comprehensive system with sufficient consistency to comply with the notion that the landscape is an entity, which should be managed accordingly? Cooperation of the scientific experts with those involved in the practical side, and alternating plenary reporting with subgroup visits to farms in the rural landscapes of the participants' countries, allowed for the development of some truly interdisciplinary teamwork. Organic agriculture has been included to find out how organic agriculture contributes to the rural landscape. 1. Introduction. Background and problem statement. Objectives. Approach. Structure of the report. 2. Research Methods. Outline of a unifying concept. On the complementarity of interdisciplinary Holism and disciplinary reductionism. Dissemination of results. 3. Results. Introduction. Explanation of the checklist. Criteria for the (a)biotic realm: (a)biotic realm (J.D. van Mansvelt, D. Znaor). Environment. Clean environment. Fertile and resilient soil. Water quality. Air quality. Wild fire control. Food and fibre sufficiency and quality. Nationally sufficient and regionally sustainable levels of food and fibre production. Good food and fibre quality to match sufficient quantities. Regional carrying capacity. Economic and efficient use of resources. Sustainable, site-adapted and regionally specific production system. Ecology. Bio-diversity. Flora and fauna species diversity. Bio-tope diversity. Ecosystems' diversity. Ecological coherence. Vertical coherence: onsite. Horizontal coherence: in the landscape. Cyclical coherence: in time. Eco-regulation. Animal welfare. Criteria for the social realm: economy and sociology (J.D. van Mansvelt, M.J. van der Lubbe). Economy. Good farming should pay-off. Greening the economy. Regional autonomy. Sociology. Well-being in the area. Permanent education of farmers. Access to participation. Farmers' involvement in activities outside the farm. Outsiders' involvement in farm activities. Accessibility of the landscape. Criteria for the humanity realm: psychology and physiognomy and cultural heritage (J.D. van Mansvelt, J. Kuiper). Psychology. Compliance to the natural environment. Good use of the landscape's potential utility. Presence of naturalness. A rich and fair offer of sensory qualities. Experiences of unity. Experienced historicity. Presence of cyclical developments. Careful management of the landscape. Physiognomy/cultural geography. Diversity of landscape components. Coherence of the landscape elements. Continuity of land-use and spatial arrangements. Conclusions. 4. Performances of organic agriculture. Theory and literature. Features of modern strategies. Basic concepts of organic types of agriculture. Concluding remarks. Empirical data collected from literature. Comparison of farming systems in the concerted action. Concluding remarks. 5. Uses and users. Overview of possible uses and users. Indicative links with funding. 6. References. Annex 2: Checklist's compliance with other standards for sustainable and organic agriculture (D. Znaor).